For the collectivization of the means of production, it was originally envisaged that workers will revolt and forcibly collectivize the means of production. Once collectivization takes place, money would be abolished to be replaced with labour notes and workers' salaries would be determined in democratic organizations of voluntary membership based on job difficulty and the amount of time they contributed to production. These salaries would be used to purchase goods in a communal market. This contrasts with anarcho-communism, where wages would be abolished and where individuals would take freely from a storehouse of goods "to each according to his need". Notwithstanding the title, Mikhail Bakunin's collectivist anarchism is seen as a blend of individualism and collectivism. Collectivist anarchism is most commonly associated with Bakunin, the anti-authoritarian sections of the International Workingmen's Association and the early Spanish anarchist movement. Giuseppe Fanelli met Bakunin at Ischia in 1866. In October 1868, Bakunin sponsored Fanelli to travel to Barcelona to share his libertarian visions and recruit revolutionists to the International. Fanelli's trip and the meeting he organised during his travels provided the catalyst for the Spanish exiles, the largest workers' and peasants' movement in modern Spain and the largest anarchist movement in modern Europe. Fanelli's tour took him first to Barcelona, where he met and stayed with Elie Recluse. Recluse and Fanelli were at odds over Recluse's friendships with Spanish republicans and Fanelli soon left Barcelona for Madrid. Fanelli stayed in Madrid until the end of January 1869, conducting meetings to introduce Spanish workers, including Anselmo Lorenzo, to the First National. In February 1869, Fanelli left Madrid, journeying home via Barcelona. While there, he met with painter Josep Lluís Pellicer and his cousin Rafael Farga i Pellicer along with others who were to play an important role establishing the International in Barcelona as well as the Alliance section. In 1870, Bakunin led a failed uprising in Lyon on the principles later exemplified by the Paris Commune, calling for a general uprising in response to the collapse of the French government during the Franco-Prussian War, seeking to transform an imperialist conflict into social revolution, or what Vladimir Lenin later termed revolutionary defeatism. In his Letters to A Frenchman on the Present Crisis, Bakunin also argued for a revolutionary alliance between the working class and the peasantry, advocated a system of militias with elected officers as part of a system of self-governing communes and workplaces and argued the time was ripe for revolutionary action, saying that "we must spread our principles, not with words but with deeds, for this is the most popular, the most potent, and the most irresistible form of propaganda. These ideas and corresponded strikingly closely with the program of the Paris Commune in 1871, much of which was developed by followers of Pierre-Joseph Proudhon as Marxists were almost entirely absent from the Commune. Bakunin was a strong supporter of the Paris Commune, which was brutally suppressed by the French government. He saw the Paris Commune as above all a "rebellion against the State" and commended the Communards for rejecting not only the state, but also revolutionary dictatorship. In a series of powerful pamphlets, he defended the Paris Commune and the International against the Italian nationalist Giuseppe Mazzini, thereby winning over many Italian republicans to the International and the cause of revolutionary socialism. The collectivist anarchists at first used the term collectivism to distinguish themselves from the mutualism of the followers of Proudhon and the state socialists associated with Karl Marx. In his 1867 essay "Federalism, Socialism, and Anti-Theologism", Bakunin wrote that "we shall always protest against anything that may in any way resemble communism or state socialism", which Bakunin regarded as fundamentally authoritarian. Bakunin's disagreements with Marx which led to the attempt by the Marx party to expel him at the Hague Congress in 1872 illustrated the growing divergence between the anti-authoritarian sections of the International, which advocated the direct revolutionary action and organization of the workers and peasants in order to abolish the state and capitalism; and the sections allied with Marx, which advocated the conquest of political power by the working class. Bakunin was "Marx's flamboyant chief opponent" and "presciently warned against the emergence of a communist authoritarianism that would take power over working people". The anti-authoritarian majority which included most sections of the International created their own International at the St. Imier Congress, adopted a revolutionary anarchist program and repudiated the Hague resolutions, rescinding Bakunin's alleged expulsion. Although Bakunin accepted elements of Marx's class analysis and theories regarding capitalism, acknowledging "Marx's genius", he thought Marx's analysis was one-sided and that Marx's methods would compromise the social revolution. More importantly, Bakunin criticized authoritarian socialism which he associated with Marxism and the concept of dictatorship of the proletariat which he adamantly refused. Indeed, Bakunin's maxim was that "[i]f you took the most ardent revolutionary, vested him in absolute power, within a year he would be worse than the Tsar himself. 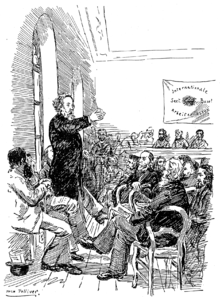 The anti-authoritarian sections of the International proclaimed at the St. Imier Congress (1872) that "the aspirations of the proletariat can have no purpose other than the establishment of an absolutely free economic organization and federation, founded upon the labour and equality of all and absolutely independent of all political government" in which each worker will have the "right to the enjoyment of the gross product of his labours and thereby the means of developing his full intellectual, material and moral powers in a collective setting". This revolutionary transformation could "only be the outcome of the spontaneous action of the proletariat itself, its trades bodies and the autonomous communes". A similar position was adopted by the Workers' Federation of the Spanish Region in 1882 as articulated by an anarchist veteran of the International Jose Llunas Pujols in his essay "Collectivism". By the early 1880s, most of the European anarchist movement had adopted an anarcho-communist position, advocating the abolition of wage labour and distribution according to need. Ironically, the collectivist label then became more commonly associated with nominally state socialists such as Marxists–Leninists who advocated the retention of some sort of wage system during the transition to full communism. The anarcho-communist Peter Kropotkin attacked this position in his essay "The Collectivist Wages System", which was reprinted in his book The Conquest of Bread in 1892. Bakunin's libertarian socialism was known as collectivist anarchism, where "socially: it seeks the confirmation of political equality by economic equality. This is not the removal of natural individual differences, but equality in the social rights of every individual from birth; in particular, equal means of subsistence, support, education and opportunity for every child, boy or girl, until maturity and equal resources, and facilities in adulthood to create his own well-being by his own labor". The dispute between Bakunin and Marx highlighted the differences between anarchism and Marxism. Bakunin argued—against certain ideas of a number of Marxists—that not all revolutions need to be violent. He also strongly rejected Marx's concept of the dictatorship of the proletariat, a concept that vanguardist socialism including Marxist–Leninism would use to justify one-party rule from above by a party representing the proletariat. [The Marxists] maintain that only a dictatorship—their dictatorship, of course—can create the will of the people, while our answer to this is: No dictatorship can have any other aim but that of self-perpetuation, and it can beget only slavery in the people tolerating it; freedom can be created only by freedom, that is, by a universal rebellion on the part of the people and free organization of the toiling masses from the bottom up". As far as learning was concerned, Marx was, and still is, incomparably more advanced than I. I knew nothing at that time of political economy, I had not yet rid myself of my metaphysical observations. [...] He called me a sentimental idealist and he was right; I called him a vain man, perfidious and crafty, and I also was right. Bakunin found Marx's economic analysis very useful and began the job of translating Das Kapital into Russian. In turn, Marx wrote of the rebels in the Dresden insurrection of 1848 that "[i]n the Russian refugee Michael Bakunin they found a capable and cool headed leader". Marx wrote to Friedrich Engels of meeting Bakunin in 1864 after his escape to Siberia, saying: "On the whole he is one of the few people whom I find not to have retrogressed after 16 years, but to have developed further". Bakunin has sometimes been called the first theorist of the "new class", meaning that a class of intellectuals and bureaucrats running the state in the name of the people or the proletariat—but in reality in their own interests alone. Bakunin argued that the "[s]tate has always been the patrimony of some privileged class: a priestly class, an aristocratic class, a bourgeois class. And finally, when all the other classes have exhausted themselves, the State then becomes the patrimony of the bureaucratic class and then falls—or, if you will, rises—to the position of a machine". Bakunin also had a different view as compared to Marx's on the revolutionary potential of the lumpenproletariat and the proletariat. As such, "[b]oth agreed that the proletariat would play a key role, but for Marx the proletariat was the exclusive, leading revolutionary agent while Bakunin entertained the possibility that the peasants and even the lumpenproletariat (the unemployed, common criminals, etc.) could rise to the occasion". Bakunin "considers workers' integration in capital as destructive of more primary revolutionary forces. For Bakunin, the revolutionary archetype is found in a peasant milieu (which is presented as having longstanding insurrectionary traditions, as well as a communist archetype in its current social form—the peasant commune) and amongst educated unemployed youth, assorted marginals from all classes, brigands, robbers, the impoverished masses, and those on the margins of society who have escaped, been excluded from, or not yet subsumed in the discipline of emerging industrial work. [...] [I]n short, all those whom Marx sought to include in the category of the lumpenproletariat". The difference between collectivist anarchism and anarcho-communism is that under the former a wage system is retained based on the amount of labor performed. Like collectivist anarchism, anarcho-communism also advocates for the socialization of production, but the distribution of goods as well. Instead of "to each according to his labor", in anarcho-communism the community would supply the subsistence requirements to each member free of charge according to the maxim "to each according to his needs". Collectivist anarchism stresses collective ownership of productive, subsistence and distributary property while anarcho-communism negates the concept of ownership in favor of usage or possession with productive means being a possession not owned by any individual or particular group. Anarcho-communists believe that subsistence, productive and distributive property should be common or social possessions while personal property should be private possessions. Collectivist anarchists agree with this, but disagree on the subject of remuneration as some collectivist anarchists such as Bakunin believe in the remuneration of labor while anarcho-communists such as Peter Kropotkin believe that such remuneration would lead to the recreation of currency and that this would need a state. Thus, it could be said that collectivist anarchists believe in freedom through collective ownership of production and a communal market of sorts to distribute goods and services and compensate workers in the form of remuneration. Collectivist anarchism could also be seen as a combination of communism and mutualism. Collectivist anarchists are not necessarily opposed to the use of currency, but some while opposing the retaining of money—propose the adoption of labour vouchers or "personal credit" (such as participatory economists). Most collectivist anarchists see their philosophy as a carryover to anarcho-communist, but some see the system and the use of a labour voucher system as permanent rather than a transition. Collectivist anarchist James Guillaume argued that such a society would "guarantee the mutual use of the tools of production which are the property of each of these groups and which will by a reciprocal contract become the collective property of the whole [...] federation. In this way, the federation of groups will be able to [...] regulate the rate of production to meet the fluctuating needs of society". They argue for workplace autonomy and self-management, saying that "the workers in the various factories have not the slightest intention of handing over their hard-won control of the tools of production to a superior power calling itself the 'corporation'". Another industry that was totally re-organized was hair-cutting. Before July 19th, there had been 1,100 hairdressing parlors in Barcelona, most of them extremely marginal. The 5,000 assistant hairdressers were among the lowest-paid workers in Barcelona. The Generalitat had decreed a 40-hour week and 15 percent wage increase after July 19th—one of the Esquerra’s attempts to woo worker support. This spelled ruin for many hairdressing shops. A general assembly was held and it was agreed to shut down all the unprofitable shops. The 1,100 shops were replaced by a network of 235 neighborhood haircutting centers, with better equipment and lighting than the old shops. Due to the efficiencies gained, it was possible to raise wages by 40 percent. The entire network was run through assemblies of the CNT barber’s union. The former owners became members of the union. ^ Bakunin, Mikhail. "Federalism, Socialism, Anti-Theologism by Michael Bakunin". marxists.org. Retrieved 1 April 2018. ^ a b No profile created for this contactAnarchism: A Documentary History of Libertarian Ideas, Volume One |. Black Rose Books. Retrieved on 2013-07-12. ^ a b Woodcock, George (1962, 1975). Anarchism, p. 158. Harmondsworth, England: Penguin Books. ISBN 0-14-020622-1. ^ ""Marxism and Anarchism: The Philosophical Roots of the Marx-Bakunin Conflict – Part Two" by Ann Robertson" (PDF). workerscompass.org. Retrieved 1 April 2018. ^ Nicholas Thoburn. "The lumpenproletariat and the proletarian unnameable" in Deleuze, Marx and Politics. ^ James Guillaume. Bakunin on Anarchism. p. 376. ^ James Guillaume. Bakunin on Anarchism. p. 364.